by C.S. Einfeld and Aaron Einfeld. The Faeries of Southnut are in big trouble. Lord Darkwater is up to no good. The White Castle of Doru is under attack by the greatest army Princess Fiera's ever seen. Lord Darkwater is poised to crush her tiny kingdom unless the king gives Fiera up to become his wife. Well, fffungus! She's having none of that! The race is on for Fiera to outwit Lord Darkwater's Dragonfly Riders, Bat Brigades, and even a giant, faerie - eating Spider to save herself and, before it's too late, her whole world. This is a classic fairy tale with a contemporary feel and I read it in just a couple of sittings. Aimed at tweens, this beautiful feisty little book kept me (aged 42) totally absorbed and entertained. 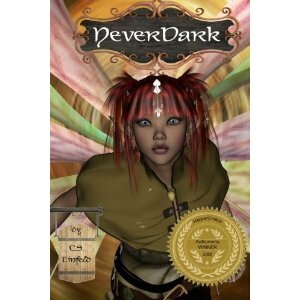 Fiera is a fairy whose life and home is under threat and who must embark on a quest to save all she holds dear. The format isn't new, but the telling is fresh and funny. Einfeld's voice jumps off the page with humour, originality and a sense that you are in the company of a born story teller. I instantly bonded with the characters - all distinctive and wonderful. (Manuel the crow is my favourite). I could picture this as a Pixar movie - there's comedy, pathos and adventure in spades. Added to this, Aaron's illustrations made my heart skip a beat every time one appeared on the page. If you have children, I urge you to get them a copy. If you don't, then read it yourself. What an absolute treat! I have this and have been reading it to my kids every night! My daughter especially LOVES this and always begs me to read more! Hi Becca, I'm reading The Talking Parcel with my kids at the moment. It was my absolute favourite when I was young. But I loved Neverdark so much it's lined up as our next read!